Shimla is a gateway for the north-western Himalayan region and is built across a range of hills and connecting ridges; spectacular views can be seen in this area with rows of snow capped peaks disappearing in the distance. It is an active market town made up of a warren of twisting backstreets. In the 19th century the town was a district of British India and summer headquarters of the government of the province. 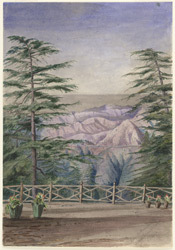 It was a popular retreat for the residents of the plains and would have provided a welcome respite from the harsh Indian sun. There were several European schools, a barracks and a sanatorium here.